The yellow metal regained a bit of ground, but things look tough going forward. For the first dozen years of the new millennium, the price of gold soared, creating a huge commodities boom that energized the precious-metals sector. Yet in 2013, gold started falling from that level, and poor performance in 2014 and 2015 left many gold investors wondering whether the yellow metal would ever hit bottom. 2016 provided some relief to those who were hardest hit by gold's plunge, with a modest bounce of about 8% from where it started the year to produce the first win in four years. Investors in the SPDR Gold Shares ETF (NYSEMKT:GLD) enjoyed most of those gains, and many mining stocks saw even better performance. However, challenging conditions could point to further difficulties ahead. Let's look at how gold performed in 2016 and why so many investors were disappointed. What moved the price of gold in 2016? The most impressive part of gold's upward move in 2016 came early in the year, when the yellow metal climbed from around $1,060 per ounce all the way to $1,275. At that point in the year, there was a lot of uncertainty in the financial markets generally that drove some investors toward the perceived safe haven of gold. In particular, the stock market saw a dramatic decline, driven largely by a new commodities plunge that pushed the price of crude oil below $30 per barrel. Even worse, stock markets in China came under threat, and some believed that a greater than 20% drop in the Shanghai Composite could blossom into a full-fledged crisis with systemic implications for the global economy. At the same time, early fears that the Federal Reserve would boost interest rates quickly reversed themselves as it became clear that the economy was too fragile to support aggressive tightening of monetary policy. Indeed, throughout much of the world, central banks were even looser than in the U.S., and negative interest rates in places like Europe and Japan created unprecedented conditions that markets had to adapt to in the new reality. Low rates supported gold by making the financing necessary to hold precious-metals positions cheap. At mid-year, gold prices got another lift from the turmoil involved in the U.K. Brexit decision. The idea that Britain would leave the European Union prompted a substantial drop in the British pound, driving interest in gold among British investors. A pause in the upward movement of the U.S. dollar also helped support gold prices in the first half of the year. Yet toward the end of 2016, gold gave up much of its gains. After hitting highs of nearly $1,375, gold ended the year more than $200 per ounce lower, closing around $1,145. One reason for the slump toward the end of the year was the fact that concerns from earlier in 2016 didn't turn out to be big deals. Brexit didn't create lasting trouble, and stock markets avoided any major downturn in the typically volatile fall months. Even the election of Donald Trump in the U.S. presidential election didn't create a lasting move upward for gold, and the ensuing stock market rally came largely at the expense of precious metals. Macroeconomic issues also played a role in gold's slump. When the Federal Reserve moved forward with an interest rate increase in December, it also signaled its intent to make three more increases during 2017. That set the tone for an environment in which gold traders would find it marginally harder to finance their purchases. Combined with weaker consumer demand in key areas like India and China, fundamentals for gold ended 2016 looking fairly weak. 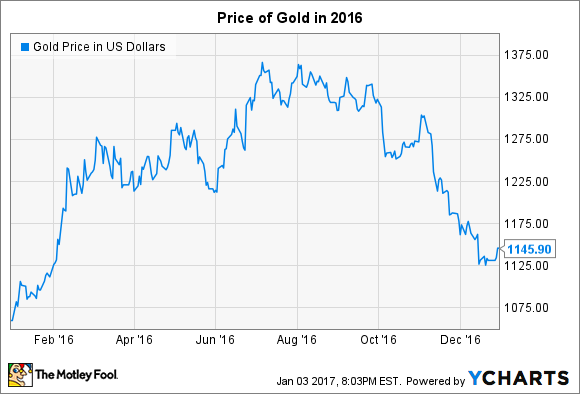 What's ahead for the gold market in 2017? Looking ahead, 2017 will be an interesting year for gold. Rising rates could send prices down, but the Fed has changed its mind before, and unexpected economic weakness could provide upward strength for the gold market. Moreover, the chances of unpredictable events appear to be improving this year, especially as geopolitical alliances shift and talk of trade tensions rises. All in all, it's entirely possible that gold will manage to overcome downward pressure from interest rates and continue its advance in the coming year.